Master the popular art of Japanese Amigurumi and take your skills to the next level with this enchanting illustrated guide for creating pandas, rabbits, penguins, and other animals from the author of Ami Ami Dogs, Ami Ami Dogs 2, and Ami Ami Kittens.The Japanese art of Amigurumi—which translates to knitted stuff toy—is a crocheting technique that creates adorable stuffed animals with large heads and small bodies. 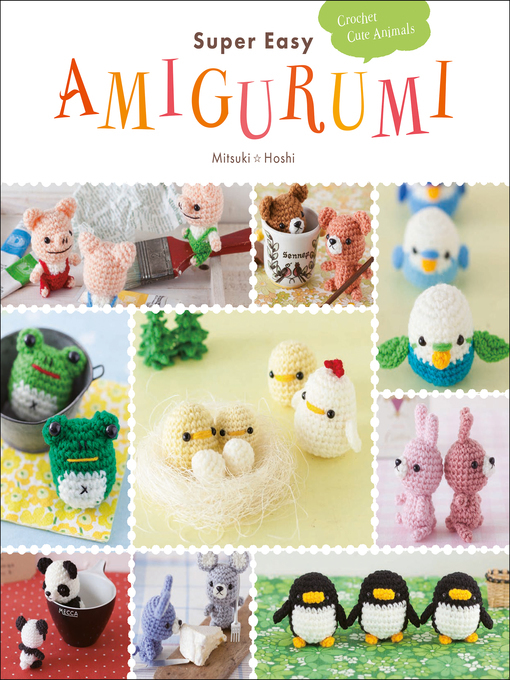 In her previous books, Mitsuki Hoshi taught crocheters how to make cute Amigurumi dogs and cats. Now, she shows them how to knit a range of popular animals, including a chick, chicken, parakeet, penguin, panda, frog, pig, rabbit, mouse, and bear.Super Easy Amigurumi begins with basic crochet techniques to create four animals, each increasing in complexity: the chick, chicken, parakeet and penguin. Clear and easy photos demonstrating the fundamental crochet skills accompany and guide you through the instructional crochet charts. Starting off with basic crochet techniques for beginners and developing into more challenging patterns for experts, Super Easy Amigurumi is perfect for knitters of any level!